Cave Story, the freeware action adventure game from indie developer Daisuke Amaya, has a retro sounding soundtrack. It's perfect fodder to be recreated with Ronald McDonald ads. Actually, that should read "Donald McDonald" as these are Japanese ads, and the character is named "Donald McDonald" and not "Ronald McDonald". A series of Japanese McDonalds ads have been spliced together in order to reproduce the Cave Story theme and give people nightmares. Welcome to hell. 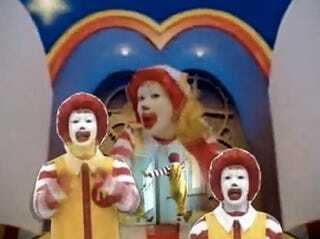 Ronald McDonald hell, er, Donald McDonald hell. Whichever. This is the Cave Story theme — compare with the McDonalds version. Play them both at the same time to give yourself a headache. Cave Story will be released on WiiWare in North America this May. Thanks Nightwheel for the tip!